The famous chef's latest cookbook, 'Farm to Fork,' serves up meaty local dishes for omnivores who shop at the farmers market. July 6, 2010, 10:31 a.m.
Can you shrink your food miles and eat your bacon, too? According to Emeril Lagasse, you most deliciously can. The famous chef’s latest cookbook, "Farm to Fork: Cooking Local, Cooking Fresh", is a call to foodies who love local ingredients — especially if they come from animals. Here’s one locavore-friendly book that’s decidedly vegan-unfriendly. The recipes in "Farm to Fork" are a far cry from Michael Pollan’s advice in "The Omnivore’s Dilemma": “Eat food. Not too much. Mostly plants.” Seriously — while I have nothing against eating local, humanely raised, drug-free meat in moderation, many of Emeril’s meat-heavy recipes scare me a bit — and they scare my arteries a lot. Forget making up for a fried chicken main course with a lighter side. In "Farm to Fork", Emeril is all about Fried Chicken and Buttermilk Waffles — with Black Pepper Maple Syrup and Whipped Vanilla Butter to boot. He doesn’t just recommend local quail; he wants you to make Bacon-Wrapped Quail with Sausage, Sage, and Chestnut Dressing — with butter and heavy cream, of course. The cookbook is organized by ingredient, so I quickly skipped over to the “leafy greens” section expecting lighter fare — to find every single recipe save one was laden with heavier animal ingredients — bacon, sausage, turkey, heavy cream and cheese. Perhaps to delay the inevitable heart attack, the recipes don’t include calorie information — or carbon footprint information. After all, local, organic meats generally have much higher carbon footprints than their plant-based counterparts. As Michael Pollan and many eco-foodies have pointed out, eating lower on the food chain is imperative — for environmental and health reasons. Emeril chooses not to address the carbon footprint of his meaty recipes. Instead, he simply focuses on sourcing food locally, urging readers to support local farmers markets and urban gardening. Apparently, Emeril was among a few chefs who started a farm co-op in Mississippi back in the early 1980s and began a “hog Wednesdays” tradition that put every part of freshly slaughtered, locally raised pigs to good use. While clearly, Emeril and I don’t eat alike, I did appreciate some of Emeril’s greener kitchen tips, like creating flavored oils to make use of extra herbs and canning and preserving to enjoy the harvest year-round. DIYers will find recipes for homemade mozzarella, brandied cherries, hot sauce and more. And to be fair, while most of Emeril’s recipes are too much for my arteries to handle, many could be employed for those special occasions when you decide to throw caution to the wind. 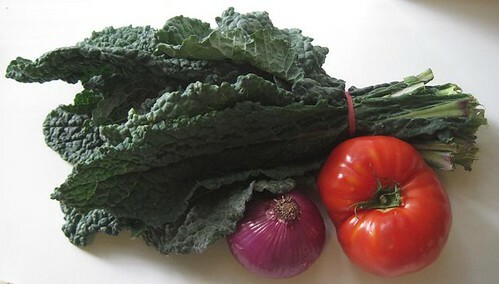 Plus, a few dozen recipes are relatively healthy — like the Tuscan Kale and White Bean Ragout I decided to make. I stopped by the farmers market for the produce, even switching out the canned tomatoes called for in the recipe for a fresh local one. The result was a healthy, flavorful, delicious, and fresh local dish. I just wish "Farm to Fork" had more recipes like this one — and fewer meat-and-butter ones. Still, if you know someone who refuses to eat vegetables unless they’re cooked with bacon and heavy cream, "Farm to Fork" could make for a decent gift that introduces your unhealthy friend to the farmers market. The famous chef's latest cookbook 'Farm to Fork' serves up meaty local dishes for omnivores who shop at the farmers market.